One of the best things you can do for your garden is to add long-lasting solar garden lights. Not only can you light up pathways and stairs making them safer, but you can also add cool effects and lighting details to your and the surrounding landscaping. We researched some of the best brands and top-rated products to help you find the right set for your yard. Before we get started, let’s take a look at some of the key features to keep in mind. Material: Some of these lights are made of tough plastic while others are composed of metal. Neither one is really better than the other but they do give a much different look to your yard or garden. Pieces: When it comes to how many lights are included in a set, you have a lot of options depending on what you need. Some of these sets only come with 2 lights while others include as many as 16. Weather Resistant: All of these lights are weather resistant so you can leave them outside all year long. This is something you should consider in conjunction with the warranty as damage from the elements probably won’t be covered after the warranty expires. Finish: This varies depending on the material. Plastic lights are usually black while metal ones vary. They can either be the color of the metal they’re made of or plated with something to make them look more attractive. Size: These lights have stakes on the bottom and you install them by pushing them into the ground. The size is the entire length from top to bottom and will vary depending on how far you push them in. Warranty: Warranties vary a lot with these lights. The most common warranty period is 1 year though you will find items on this list that have very short warranties or none at all as well as one with lifetime coverage. Now that you know what’s important when it comes to solar lights, let’s get into our reviews. We put our top and budget picks at the top of the list so, if you’re in a rush, you’ll be sure to see them. That’s the best way to get an idea of the range that’s out there. Whether you’re looking for small accents or high power solar garden lights, we’ve got you covered. Ready? Let’s get started. 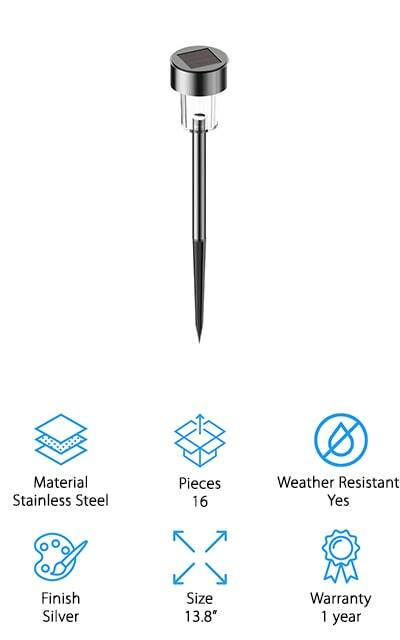 If you’re looking for some cool solar garden lights, check out our top pick, the Aityvert Solar Garden Torch Light. What’s so cool about them? They have a gorgeous dancing flame lighting effect that’s created by the encasement and internal LED. The built-in rechargeable lithium-ion battery charges with sunlight during the day and last for up to 10 hours at night on sunny days when they get a lot of light. A daylight sensor turns them off automatically when day breaks. Installation is super easy, just push these large solar garden lights stake into the ground wherever you want to add a bit of light and a candle-lit feel to your garden or yard. They’re weatherproof and can be used all year round and in any weather, including rain, snow, frost, and even hail. 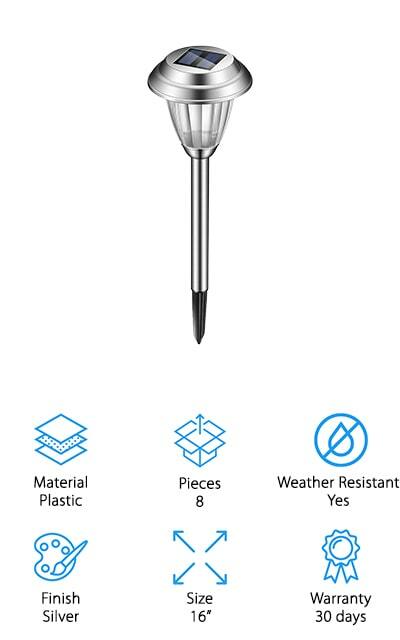 The best LED solar garden lights for the money are our budget pick, these URPOWER Solar Lights. One of the cool things about this product is that they’re adjustable. Not only can you adjust the solar panels to make sure they get as much light as possible during the day, but you can also adjust the light so it hits just the right spot. That makes these a great choice if you’re looking for something to add light to the front of your home or to put a spotlight on something in your yard. You can install these lights 2 ways, by inserting them into the ground or mounting them to a wall with the included screws. These lights last between 6 to 9 hours overnight depending on whether you’re using them at full power or dimmed. Next up are the SolarGlow Solar Garden Lights. This is a great set of 6 lights that can be positioned along a path, inside a flower bed, or around a deck. Installation is really easy since there are no wires involved. Just push the stakes into the ground and your lights are ready to go. The batteries recharge themselves during the day and the lights turn on automatically every evening at dusk. You don’t have to worry about the weather, either, since these lights are weather resistant and can handle rain, snow, frost, or sleet. The tough, rugged plastic construction is sealed tight so no water will get in. That’s not all, these lights come with a 100% lifetime replacement warranty as well as a no-questions-asked money back guarantee if you’re not satisfied for any reason. 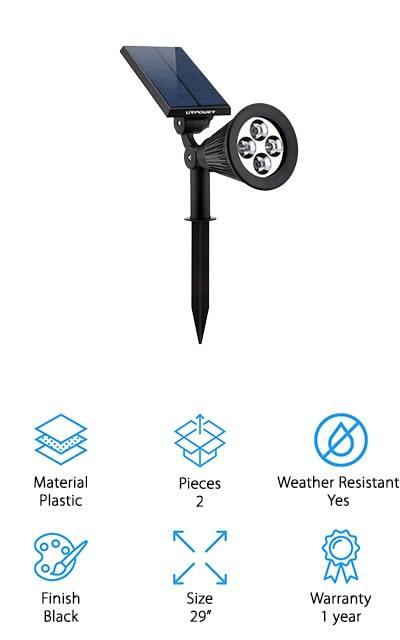 Moonrays Solar Path Lights are high-quality metal solar garden lights that create a gorgeous lighting effect that will really make your yard stand out. These are some of the brightest lights we came across in our research with each light giving off 30 lumens of warm, white light which is about 25 times more than some comparable products. A ribbed glass lens and 120-degree beam angle help spread the light around so this light covers a lot of ground. Installation is as easy as staking them in the ground and there’s no complicated wiring or batteries. They charge during the day using the sun and turn on automatically at dusk and off again at dawn to save power. The elegant rubbed bronze finished has a very polishes look and they’re even weatherproof for year-round use. 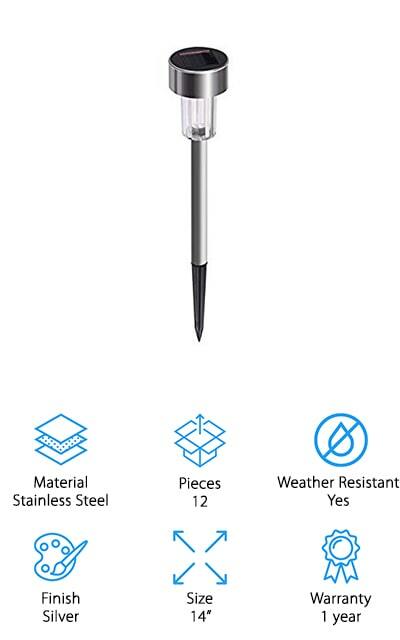 The set of solar pathway light from Sunnest consists of 12 stainless steel solar garden lights. These lights a little smaller than what we’ve seen in our reviews so far but this is a perfect choice if you’re looking for something simple and somewhat modern looking to add small, bright accents. Plus, as we said, there are 12 of them so you can cover a lot of areas and put them wherever you want. Line a walkway or just place one here and there as accents along a wall of the front of your home. 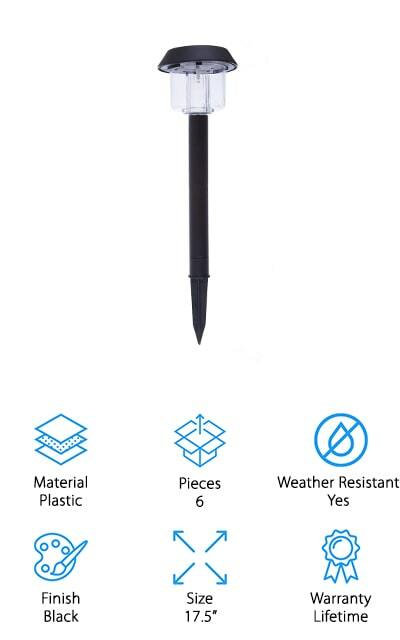 Installation is simple plus, they’re weatherproof and waterproof so they can tolerate any kind of weather. These lights turn on and off automatically and are covered with a 1-year replacement or money-back warranty if something goes wrong. 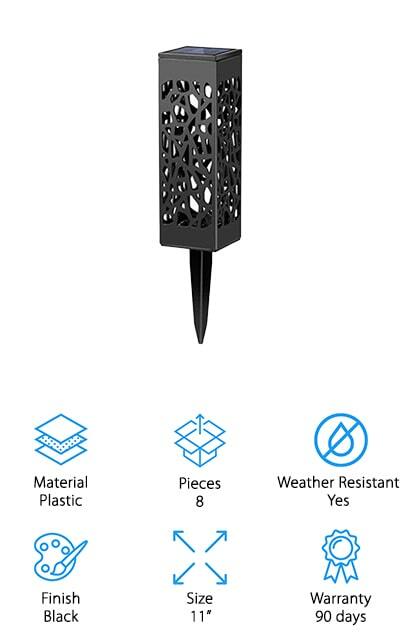 If you want something that’s more decorative than functional, the Maggift Solar Garden Lights might be for you. These lights only have 3 lumens so they’re not particularly bright but they are meant to be decorative and create a warm, beautiful effect in your garden. The lights are encased inside a plastic box with cutouts that create lace-like patterns on your grass or walkway. They’re weather-resistant and can be kept outside no matter what the season. Installation is easy, just place them where you want them and press the stake into the ground. Make sure they have plenty of exposure to sunlight during the day for best results. They need about 6 to 8 hours of sun exposure to fully charge and will provide about 8 to 10 hours of gentle, glowing light. Our next choice is the voona Solar Outdoor Lights, a set of 8 sterling silver lights that have a sleek, modern look and create a beautiful star pattern on the ground. These lights charge during the day and illuminate for up to 8 hours when the battery is full. Plus, they turn on and off automatically to conserve as much energy as possible. One thing to keep in mind is that these lights only have an output of 6 lumens, which isn’t very bright, but they’re not meant to light up large areas. This set is the perfect choice if you want to add something more decorative to your garden because they truly produce a beautiful, eye-catching effect. If you’re not satisfied for any reason, simply return them within 30 days for a full refund. 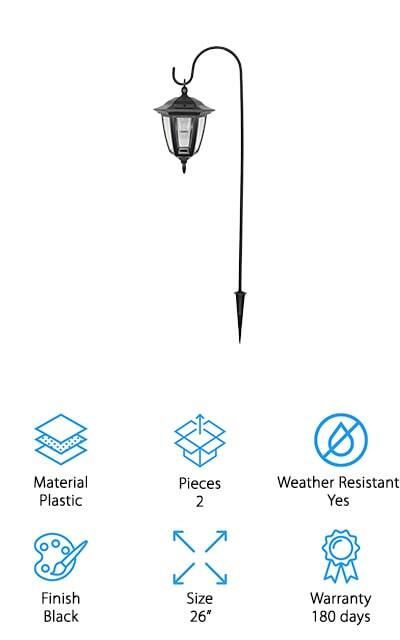 For a great set of high-quality solar garden lights, check out the SURSUN Solar Pathway Lights. For one thing, this is a set of 16 so it’s perfect if you were looking to accent a long walkway or add some light around a large flower bed. These lights are more for decorative purposes because they only put out 1.2 lumens each but their modern, sleek design make a beautiful accent. They need about 6 to 8 hours of strong sunlight to charge and can last as long as 10 hours overnight, turning on and off automatically to conserve as much battery life as possible. You don’t need to worry about snow, rain, sleet, or frost because these lights are completely weatherproof. They come with a 12-month replacement and refund warranty if you’re not satisfied for any reason. Next up in our solar garden lights review are the Maggift Hanging Solar Lights. These lights are the most unique of all the items we reviewed. 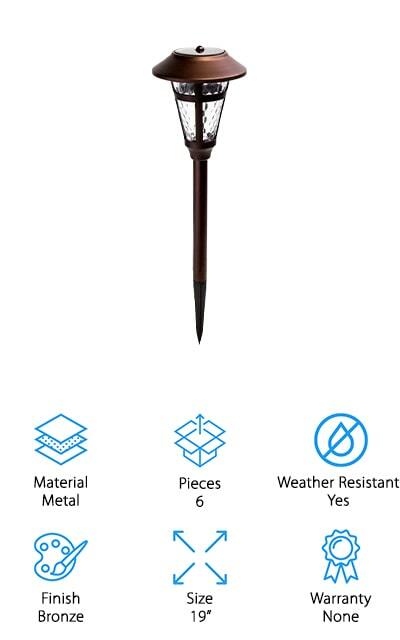 Unlike most of our other picks, these lights are designed as a hanging lantern rather than a simple stake that you push in the ground. There are 2 options for installation. You can either insert the included shepherd’s hook into the ground to hang them or hang them from hooks placed around your front porch or even from the branches of trees in your yard. The included hooks measure 26-inches from top to bottom so you have a lot of control over height. These lights put out 4 lumens which are bright enough to provide some illumination but they’re better suited for decorative use. They also include a 180-day warranty. 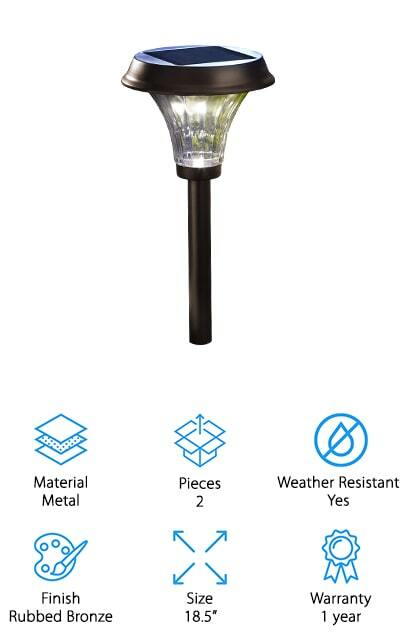 While some of our picks have been for decorative purposes only, the GIGALUMI Solar Pathway Lights are bright solar garden lights that are bright enough to provide safe illumination. Each light puts out about 10 lumens which are brighter than a lot of the purely decorative lights that we found. The bronze metal finish adds a touch of elegance and the glass lens is clearer than plastic and creates a beautiful, eye-catching pattern on the ground. When these lights are fully charged, they’ll last for 10 or more hours. They’re weatherproof and able to withstand rain, snow, and even super cold temperatures. This set includes 6 lights in all so you can spread them out to line a walkway or place them against the front of your house for a cool lighting effect.